Do you recognize this chemical equation? A Form to entice the visitor to action, which can be a simple button or even a link. This shouldn’t be a revelation to any regular reader of The Conversion Scientist. However, you will see many pages that lack content, an explicit offer or both. 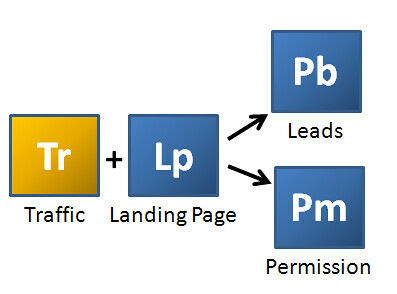 Of course, a landing page will not generate any leads or sales without something more. This formula is important in that it highlights the fact that your landing page must generate equal parts Leads and Permission in order to continue the conversation with prospects. Combining Content with Leads for which you have Permission to communicate provides the components for generating effective Email. Given an amount of Email, what reaction would you create to turn your email into Web Traffic? Find out in my post The Chemistry of Content at The Content Marketing Institute. Hint: Consider what mixing an Offer with your Email would do. Youranium is a powerful radioactive element derived form your knowledge of your visitors. Sales is gold to a business. You should subscribe to the The Conversion Scientist by email to find the reactions that create gold for your business. Brian Massey is a veteran online marketing strategist, writer and national speaker. His practice, Conversion Sciences is conducting experiments to determine how business Web sites can turn visitors into leads and sales. Follow our blog and put some science into your online marketing. Warning: this information will make you a more successful marketer, but may also put your immediate job in jeopardy. Unfortunately for those of us in marketing, our nemesis is often the organization in which we work; that Dilbert inspired, plodding structure full of people that think they know how to market. Such a beast is often resistant to our most powerful weapons, such as positive results. The best way to defeat such a daunting foe is through patience and stealth. As marketers, we must build our strength, our knowledge and our skills. I propose that you consider building your own secret laboratory, your own Xanadu. This is the place you go to explore new marketing strategies and ask questions that others may not have the guts to ask. What if we used more copy on our landing pages? What if we tried an interesting headline? Would audio or video increase our conversion rates? Will social media work in our business? These are the questions that take time to sell internally, especially when you don’t have the data. These are the concepts that IT is designed to thwart. It’s time to unshackle yourself. Build your own conversion laboratory. Now, as heroes, we want to do good in the world. This means doing no harm to our organization’s brand. We don’t want to work against our organizations already plodding attempts to communicate. We want to minimize cost – most of us aren’t Bruce Wayne – and maximize automation. This will make our time in the lab most productive. I cover all of the guidelines in my Search Engine Land column Setting Up Your Own Conversion Lab, Part 1. We are fortunate to have many of the tools needed in our lab available for free or at low cost. Create and host content of many types. I make specific recommendations in Your Secret Conversion Lab, Part 2. It may be tempting the done a hero’s uniform once you begin to feel the power of what you learn in your lab. Honestly, It’s best to stay under the radar. Let us know which tools you find in your lab in the comments, and please share any interesting results you get from your experiments. P.S. Want to know what to test in your lab? Get my Notes from the Lab and see what I’m up to. Do you know the things that could make your landing pages really sing? There are marketers out there conducting experiments online to find out what works best; what turns more visitors into prospects and customers. These are bare-teeth marketers who sometimes cross the line of propriety. Some even cross legal lines. Don’t throw the things they’ve learned out entirely. Even the most conservative brand can use one or more of these well-tested techniques to make their landing pages perform at peak levels. I’ll be sharing with you fifteen components of high-performing landing pages that you can use in your online marketing. I’ll take you through a couple of examples used in B2B marketing including one that even Apple might design. Register now. It’s free, and I’ll be answering your questions as well. Your conversion marketing practice is actually a “stack” of disciplines each of which you will have some level of capability with. Knowing exactly what you want your Web site to do for your business. Understanding the best visitors needs, the reason they are visiting today and the information they need to feel comfortable taking action. Touchpoint Personas are the important tool at this stage. What content will you create for these important visitors? Will it be articles, video, or audio? These are important considerations made easy from your touchpoint personas. How do your visitors want to hear from you? Where can your visitors be reached? Your choice of channels may include webinars, email, social media, blog posts and more. Putting the analytics and processes in place to measure the effectiveness of your efforts. This often means designing your online presence differently to enable tracking of visitor behavior. Testing your assumptions is the only way to achieve the high conversion rates that make you seem invincible to your competitors. This is how you reduce the cost of all online marketing efforts. This may sound like a tall order, and it is. However, if you are marketing online, you are involved with conversion issues by definition. The good news is that the folks at SiteTuners.com, lead by the always brilliant Tim Ash have put together the Conversion Conference. The attendees will be leading the online charge in each of their industries. I can think of no better way to get up the many learning curves that your conversion practice needs than this two day conference. You’ve likely read books written by some of the Conversion Conference Speakers, like Landing Page Optimization and Web Design for ROI. There’s no question that the speakers at this conference are the folks you want to be learning from. Check it out. You can even save $250 if you use promo code CCE650 when you register on the Conversion Conference website. If you won’t be there, I pray that your competitors won’t be either. P. S. I do a complete writeup on the Conversion Stack in The Quintessential Marketing Automation Guidebook, Conversion Stack: Marketing Automation for Performance Marketers. It is free and you should find it enlightening. "Social media is revolutionizing customer care." Yawn. "Social media is helping brands build awareness." That’s sounds interesting (not). "Social media increases the quality of the traffic coming to your site in measurable ways." Now you have my attention. It is my choice of career that has given me this singular focus when it comes to online marketing. There are other people to create brand image. There are smart, dedicated people trying to improve their company’s customer service. But, I want measurable, tangible data on how social media gets qualified prospects to a Web property, and how it helps me carry on a conversation with them making them more likely to buy. I can already hear Qwitter messages landing in my inbox. I hate Qwitter personally, but it is a FABULOUS metric, the equivalent of email’s unsubscribe rate. So, I have to listen. It’s an measure of my social media Return On Investment, my social media ROI. How many times do you have a great conversation in the social space only to find the company’s Web site opaque, posing, and irrelevant? Social media won’t work if we’re transparent in our social graph and obsequious everywhere else. Let’s encourage businesses to put content out that draws people to their Web site. They will quickly begin to realize that certain content works (educational, entertaining content) and certain content does not (home pages with self-aggrandizing copy). ROI is the great informer for these companies. If our stuff is worth talking about, why hold it back? There is a camp of social media digerati that believe social channels are not for promotion, that it is evil to advertise where conversations are the norm. But, if conversations are going on around a brand or a company, why deny the social citizenry of a chance to own or use their offerings? It’s just plain selfish to hold back. When buying is an outcome of conversation, ROI tells a company how it’s doing in starting and continuing those conversations. Let’s face it. We want the support of companies as we complain and cheer about their products. We want them to hear us, to reply to us, and to see things our way. And we are not above the occasional bribe. We regularly use ROI as a way to get attention. Online communities are arbiters and aggregators of ROI. They drive it, highlight it and can take it away. They should be rewarded for their financial contribution to companies with increased support, more say in product design… and the occasional bribe. What do eBook Groupies and Designer Laptop Bags have in Common? I’ve recently begun working with J’Tote Designer Laptop Bags, and heard a story that illustrates this concept perfectly. It seems that the women of an eBook community have developed a love for J’Tot’e’s chic laptop bags. How do we know? Mysterious spikes in J’Tote’s Web traffic led to the discovery that people were posting about them on the forum. Boxes of bags were soon waiting to be shipped to the group’s members. Visitors from this community stay on the J’Tote site longer than average, view more pages, and have a very low bounce rate (a measure of the number of visitors who leave immediately after visiting a site). The folks at J’Tote now make it a priority to tune into the conversations on the forum, and are certain to give them warning when inventory clearing sales are imminent. It is the lingo of the bottom line; the babble of budgets; the conversation of the coin. If we want more companies to engage in social media for all the “right” reasons, we need to communicate with them in this language: more visits from interested conversationalists who buy their products. We need to speak to them with ROI. It’s one thing for a company to monitor our conversations attempting to gauge positive or negative sentiment. It’s quite another for them to know that their Facebook page is generating additional visits and sales. Companies that don’t measure the ROI of social media won’t get the message. They’ll continue to ignore important communities, cut social budgets and generate plenty of negative social sentiment in the digital conversationsphere. If you’re not measuring, you’re not listening. J’Tote is listening. Are you? On July 21, I’ll be showing you ways to measure your social ROI, and in particular, your social conversion rates. Did you know there was such a thing as a social landing page? It’s nothing like your landing pages. Did you know that there are six major conversions that happen when you add social media to your sales funnel? My presentation is just one part of a spectacular Master’s Group Training being held in Austin by Webmaster World, the PubCon people. Only, you don’t have to attend a full PubCon to go. Not only will you learn from me how to measure your social media efforts, you’ll learn how to do the things that make social media work. Andy Beal will tell you about social media reputation management. Dan Zarrella will give you the low down on Twitter and Facebook optimization. Brett Tabke will show you how he reached influentials in his social graph and put PubCon registrations slashed his marketing budget. Oh, and there is also an search marketing track going on at the same time. Yawn. We’re going to make people love your business through your Web site at The Conversion Scientist. Subscribe to learn the strategies and tactics that turn more of your visitors into leads and sales. It’s time-consuming to offer 45 minutes of my time to anyone who wants to improve their online sales conversion rates. I just can’t think of any better way to introduce businesses to conversion concepts. And the people I meet on the phone are priceless. One such person is Tom Jackson of Heliski.com. His is a rare and instructive look at the power of the written word and the ineffectiveness of standard design strategies when it comes to conversion. Tom had two sites targeting the same audience, and getting about the same traffic. Both had analytics installed. This was a rare opportunity to see how two very different approaches to Web site design performed out in the real world. Which would you pick as the conversion winner? Take a look at Tom’s two sites. Which would you pick as the hands-down winner? Which would you image would have cratered his income had he relied exclusively on it? Which would you pick as the best converting site? I did a complete evaluation of these two pages in my Search Engine Land column, and you might be surprised at my conclusions: strong copy beat slick new design. The moral of the tale is that Tom measured his sites’ performance. He had the analytics in place, and was smart enough not to make changes to his site without being able to measure their effect. By leaving both sites up, he was able to rollback the changes. Do you know how changes to your site affect your business? You should. I’m offering a two hour short course on June 11 in Austin entitled Web Analytics: Tools and Best Practices. This is an Austin Entrepreneur Network short course, which means that it’s only $25. We love our entrepreneurs. Join me and find out how you can avoid huge mistakes – mistakes that rob you of leads and steal your sales. This is the second time I’ve done this presentation. Find out what attendees thought about my January short course. Read my full report on Search Engine Land, and I hope to see you on June 11. The goal of my Ion Interactive presentation “What Can We Learn from the Bad Boys of Marketing?” was to shake things up a bit. Conversion marketing is about bringing visitors to choice. B2B marketers carry this same burden. Can marketers in more conservative industries use techniques proven to increase online leads and sales in B2C markets? Not only should B2B marketers try everything that B2C businesses are using, they risk irrelevance if they don’t. In my Ion Interactive webinar, I use two B2B landing pages to illustrate how these B2C techniques can be used:Mary O’Brien Adwords Advantage landing page AdwordAdvantage.com and CoverActionPro.com. Certainly you can deliver a high-converting experience without harming your online brand, like CoverActionPro. You have to work harder. You can’t ask a committee of executives to review your pages. You have to know how your page is performing and how changes are affecting your results. You can learn more about analytics and their proper application at my AEN Short Course “Web Analytics: Tools and Best Practices” on June 11, 2010. Enjoy the Webinar and don’t miss Anna Talerico’s Conversations on Conversion podcast. You can do almost anything on the Internet now. You can monitor your finances, socialize, organize ideas,manage your job search, broadcast your travels, and recruit college students. The core conversion marketing pattern that these sites should adopt is the “Site as a Service Pattern.” This is the fifth and last of the core conversion strategies in this series. Explore this site pattern in my Conversion Science column on Search Engine Land. Read the entire column at Search Engine Land. We’re going to make people love your business through your Web site at The Conversion Scientist. There is plenty you can do to increase online sales conversions, and we share it all. Learn what that you can do to convert more of your visitors into leads and sales. What would you tell a recent marketing grad about “real” marketing? People don’t ask me to make commencement speeches. I think it’s because they don’t want me “converting” impressionable minds. Amanda McGuckin Hager of GoMarket.me has no such reservations. In fact, she’s trying to fill in the missing information that colleges are doling out to the rumored “clay-like minds” of our young adults. GoMarket.me is “Your Real World Marketing Mentor” and Amanda asked me to contribute some mentorly words for the site. What would you say to help a recent marketing graduate? Here’s what I said, and there should be no surprises if you follow The Conversion Scientist. You will have been taught a great deal about how to get people’s attention, primarily by interrupting them. You will have been steeped in the importance of message, brand, and emotion. You will have learned the importance of creative in the communication process. You will have been shown the importance of identifying your market segments by demographic, geographic and psychographic data. In the world of branding and image-building, these skills are largely sufficient. However, when you are asking “suspects” to call, register, or buy from you, conversion is the critical piece of the puzzle. We call them affiliate marketers, infopreneurs or online goo-roos. They push health care products, supplements, exercise tapes, and get-rich-quick schemes. At their best they are sophisticated landing page optimizers and savvy search engine technicians. At their worst they are spammers, forum trolls and comment leeches. These are the “bad boys” of online sales conversion (and they’re not all boys). While many of us wouldn’t want to associate the hard-hitting big-promise experience with our brands, there is much to learn from these pages, and I tackled the task of cataloging some of the best techniques in my short presentation for the Uber Advanced PPC Panel at PubCon South 2010 in Dallas. Don’t be fooled by the panel name. Christine Churchill, David Szetela and Wister Walcott dove deep into PPC topics. My angle was that improving conversion rates means more to spend on PPC. Enjoy the full audio and video right here, complete with Prezi.com animation. Either way, I promise you will immediately find some new things to test on your pages.